iPhone Photo to Computer Transfer - Transfer Photo, Camera Roll from iPhone to Computer. All photos in iPhone library are allowed to transfer compute local and you can view them on compute photo viewer with original size. iTunes cannot offer you a solution, Thanks to iPhone Photo to Computer Transfer, It allows you to transfer Photo, Camera Roll (iOS 4 above) from iPhone to Computer while preventing iPhone Photo being lost and covered. And this iPhone photo transfer also lets import music, video and podcast to iPhone library and export them to local. Even sync iPhone files to iTunes library. And now it fully supports the latest updates on Apple devices such as: iOS 8 and iTunes 12. 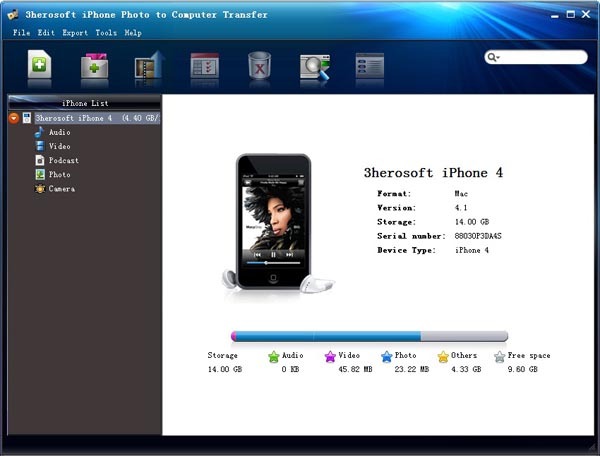 Besides, you can even use your iPhone as a portable hard disk and open iPhone with Explorer. It can keep high compatibility with all types of iPhone including iPhone 3, iPhone 4, iPhone 5, iPhone 5S/5C, iPhone 6/6 Plus, iPod touch, iPad etc. License Type: Free to try, $9.98 to buy. iTunes 9.0 or above is required. This iPhone Photo Transfer can transfer iPhone Photo, Camera Roll from iPhone to computer for backup. Transfer Music, Video, Photo, Podcast, playlists from iPhone to computer and sync them to iTunes. Copy music, video, podcast, TV show, photo to iPhone library. Easier and faster than iTunes. All music of Playlsits in iPhone library can be transferred to iTunes libray and copy to computer local..
You can use iPhone device as portable hard disc and easily store/copy/create/rename iPhone files with Explorer. With Filter and Quick Search option, you can locatet music, videos, photos files as quickly as possible and check the certain files in the list, the same function as iTunes does. Provides two models for you viewing iPhone files, view your iPhone files in thumbnails like album artwork or list view for easier manage. How to copy photos from iPhone to computer?